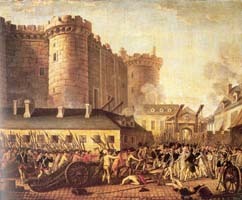 The storming of the hated Bastille Prison during the French Revolution. More than any other revolution before the 1917 Russian Revolution, the French Revolution of 1789 inspired people across the globe to look beyond the societies in which they lived and see the possibility for social change. Even though it came after the U.S. struggle for independence from Britain, the French Revolution became “the” democratic revolution. The French Revolution is known for its popular slogan “Liberty, Fraternity, and Equality.” The old society, where every person “knew their place” in a hierarchy of god-given social classes, was replaced with a new one where the ideas of freedom and equality ruled. The French Revolution secured the political rule of the capitalist class. It cleared the way for the capitalist economy to develop freely, overpowering the restrictions of the feudal regime with its big landowning estates. Nevertheless, later revolutionists including Karl Marx, Frederick Engels and many others studied carefully the many lessons of the French Revolution. Like any great social upheaval, all the social classes sought to influence the course of the revolution, even though the great social changes ultimately replaced one form of exploitation with another. Pre-revolutionary France was typical of most of the countries of 18th-century Europe, although it was the largest and among the most powerful. Politically, it was ruled by an absolute monarchy headed, in 1789, by King Louis XVI. The ruling class was the landowning aristocrats who owned vast estates. The Catholic Church was closely tied to the aristocracy. The church hierarchy of priests, bishops and monks formed a kind of second-level aristocracy. They also extracted goods from the peasants in the form of tithes and taxes. Most—up to 85 percent—of the 28 million people were peasants who toiled in conditions of serfdom. Most of the peasants did not own land, and so worked on the lords’ estates—turning over half or more of their produce to the lord in exchange for the right to live on the land. By the time of the revolution, some 15 percent of the population lived in towns that grew up on the borders between feudal and royal estates. Paris was the largest city in France, with about 500,000 people, second in Europe only to London. The towns were increasingly dominated by the influence of a new social class, the bourgeoisie—merchants, masters and bankers, who made their living trading, as the owners of small workshops selling their goods or lending. Excluded from the feudal order, this group was small but becoming increasingly wealthy. There was also a small working class. Most 18th-century French workers were craftspeople who worked in small workshops or guilds. Some worked in the textile factories, which were small by today’s standards. In Paris, for example, there were about 50 factories, each employing between 100 and 800 workers. The feudal ruling class did not initially have a money economy. Their livelihood was provided for by goods handed over by the peasants and serfs. Their riches came from conquests in battles near and far. The money economy and the bourgeoisie grew up in this climate. The nobility was eager to buy the luxuries that the merchants had to offer. More and more, new weapons for the nobles’ wars had to be bought from craftspeople—with money lent from the merchant capitalists and bankers. But the growth of this new capitalist class, the bourgeoisie, was hampered by the feudal social order. To trade, the merchants needed to travel. That meant crossing the boundaries of many feudal estates, maybe the size of a county today. But at each crossing, merchants had to pay tolls and taxes to the landowning lords. Crossing bridges meant more tolls. It was becoming more and more apparent to this merchant class: Feudalism was an extremely inefficient and backward social system. Two factors fueled the social crisis that opened the door for revolution. During the decade leading up to the revolution, France underwent the worst agricultural crisis in almost 100 years. Main staple crops like wheat consistently produced record-poor yields, followed in turn by poor harvests in nearly every other agricultural product. Famine was rampant in the countryside, making its way into the developing urban centers. In 1787, a severe drought in the summer and fall compounded the problem. Peasant rebellions were common. In 1788, the uprisings reached Paris, when unemployed workers joined the ranks of the uprisings. In the 18 months leading up to the revolution, there were at least 200 food riots recorded across France. Crowds descended on wealthy properties or places where public records of taxes, deeds and debts were held. Money was re-appropriated. Records of taxes or debts were thrown out of office windows and scattered into the streets below. The second factor driving the crisis facing Louis XVI’s regime was its attempt to raise taxes to pay for France’s recent wars in Europe and its military aid to the rebelling British colonies in North America, now the United States. To pay its debts in the midst of the economic crisis, the monarchy tried to impose taxes on all classes, including the nobles, clergy and the new bourgeoisie. As part of the process, the king allowed for representatives to make lists of grievances. But because the grievances went beyond small reforms, the king repeatedly rejected them. The Estates General was the closest thing to a national parliament under the French monarchy. It included representatives from the three estates, or social groups: the church, the nobility, and the “common people.” The Third Estate, in principle represented the “common people,” who were the vast majority of the population. In practice, in 1789, it was politically dominated by the new bourgeoisie and some liberal elements from the other two classes. The Estates General had not been called into session since 1614. Louis XVI and his advisers hoped that it would be as it had been in the past—a servile body that would accept the royal will and dutifully carry it out. The bourgeoisie had other ideas. When the session opened in May 1789, the representatives of the Third Estate immediately began to maneuver for more political rights. Under the estate system, each estate would have equal representation. Since the church and the nobility essentially voted together, the Third Estate was always outvoted even though on paper it represented over 90 percent of the population. The Third Estate demanded that each member of the Estates General vote individually, which would give them a majority. When the two feudal estates refused to agree to this plan and lose their privileged position, the Third Estate broke off from the common session and declared a “commune.” Gaining increasing confidence from the weakness of the old ruling classes in the face of widening food riots and rebellions, the commune declared itself a National Assembly—speaking in the name of the nation—in June 1789. It would not be the last time during the French Revolution that the bourgeoisie would advance their interests by relying on the power of the peasants and workers. These were all direct challenges to the authority of the king. A confrontation was rapidly coming to a head. Even before the meeting of the Estates General, the aristocracy had been in talks with foreign monarchies in Britain, Germany and Switzerland to intervene on the side of the king if a revolutionary war were to break out. 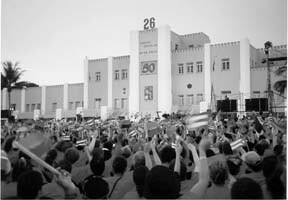 On June 20, the king tried to shut down the National Assembly, forcing the delegates to move to an indoor tennis court. The king’s army began to assemble around Paris. Rumors spread throughout the streets in the working-class districts that the king was planning to seize back power militarily. The trigger for the revolution was an unlikely event. On July 12, Louis XVI dismissed his minister of finance, Jacques Necker. Necker had faithfully tried to win over the Third Estate to fund the monarchy’s debts, but was seen as a compromiser and, to some in the bourgeoisie, an advocate. Paris responded with all-out rebellion. When a German mercenary army came to put down the revolt, fierce street fighting broke out. Militias loyal to the National Assembly, the newly formed National Guard—some 40,000 workers and peasants who had armed themselves by expropriating gun shops and armories—fought the royalist troops. Sections of the king’s French Guard mutinied and came to the aid of the revolutionaries, driving the mercenaries back. The following day the rebellion escalated. Masses of revolutionary peasants and workers were looking for weapons wherever they could find them. On July 14, word traveled to the rebel–ling masses that a cannon at the Bastille, an arms garrison, was pointed in the direction of one of the most densely populated districts of Paris. The revolutionaries, already in the streets, bravely began to march to the Bastille. Despite an attempt by the governor of Paris to negotiate with the revolutionaries, the crowd persisted that they would settle for nothing other than the taking of the Bastille. The fight for the Bastille lasted for four hours. Cries of “victory” and “liberty” rang out from the crowd as they took every conceivable weapon from the Bastille. A few prisoners who were being held there were released. The victory of the people over a fortress and professionally trained army was a soaring morale boost for all of Paris’s workers—and their “allies” in the Third Estate, the bourgeoisie. From July 14 on, the main question would be: Which class would take the lead in the revolution? The old ruling classes, the nobility and clergy, had suffered a serious defeat, but had not been wiped out yet. The peasants, propelled by the whip of hunger and hatred for their former landlords, provided the bulk of the revolution’s shock troops. The bourgeoisie, who were politically the biggest winners of the revolution up to July 14, were faced with a question. Who did they fear more: the old rulers or the masses that now controlled the streets? Both these measures appealed to the masses of people who had never before had anything like equal rights. But the peasants and workers were still starving. The bourgeoisie, like the aristocracy, did not lack. This contradiction shaped the next two years. Many nobles fled the country, plotting all the time to overthrow the revolution like the rich Cubans would do after the 1959 socialist revolution. The king and queen remained, though, and the new bourgeois rulers made every effort to keep the monarchy in place, although under the jurisdiction of the assembly. The Estates General was gone and the National Assembly, representing the small landholders, was taking its place. At this point a dual power existed, that of the crumbling feudal class and the rising power of the capitalist class. This dual power struggle was also taking place within the newly formed National Assembly, with some factions really siding with the feudal class. The king still resided in Versailles. Many of the rest of the nobles and clergy were not yet cut from their privileges. Meanwhile severe bread shortages still plagued the people of France. Between 1789 and 1791, the assembly passed a few important measures, like expropriating the property of the church. But it was largely consumed with debates between the remaining defenders of the old regime (members of the Feuillants Club, seated on the right), advocates of advancing the revolution (members of the Jacobin Club, seated on the left), and the “Girondins.” The latter group was the largest group at the time, seated at the center, and advocated a kind of moderate constitutional monarchy, the rule of the wealthy. The terms “left-wing” and “right-wing” would enter the world’s political terminology here. Members of the assembly debated. The king retained the right to veto any legislation passed, keeping the assembly deadlocked. Peasants and workers were still starving. Royalists, supported by the king, tried again and again to stage uprisings to bring back the old order. By 1791, the king was looking to escape abroad to join the royalist plotters. The monarchies of Europe were horrified by the revolution, and were looking for any reason to rid the world of this new menace to their god-given feudal rights. While Louis XVI did not trust the other monarchs, he also saw in them the only hope to regain the crown. In June 1791, the king and queen tried to escape the country. They were arrested by revolutionary guards and brought back to Paris. On April 20, 1792, the Girondin-led assembly declared war on Austria, hoping to deflect the growing pressure of the masses. The war had the opposite effect. The new French government was not prepared for war. The masses were starving. While a new kind of military force was being formed in the National Guard, the main army was still built on the old model, organized for a form of warfare that the other European powers were much more prepared to wage. Austrian and Prussian troops marched easily toward Paris. But the prospect of the armies of old Europe overturning the revolution—and surely reinstalling the “rightful” king of France, was too much for the masses of people to bear. Once again, the masses intervened. After the king tried to grab power away from the assembly in July 1792, the “sans culottes”—workers who wore work pants instead of the fashionable “culotte” knee-pants—saved the day. On the other hand, they combined this program with an all-out assault on the “enemies within.” Imprisoned royalists were tried and executed in prison. Louis XVI was executed in January 1793, ensuring if the royalists triumphed that there would be no monarchy to reinstate. In August 1793, the new revolutionary government ordered a general draft and reorganized the military on popular grounds—a measure that turned the balance in the war against Austria and Prussia. Defending the revolution at this juncture meant uprooting the counterrevolutionaries root and branch. Supporters of the old order faced execution by guillotine—as did anyone who stood in the way of the revolutionary measures. But unleashing the power of the masses ran the very risk that the original legislators of the Third Estate, gathered in a royal tennis court in Versaille, had feared. Already at the outset of “the Terror” in 1793, supporters of Hébert and Jacque Roux were calling for limiting the vote to the “sans culottes”—disenfranchising the very bourgeoisie that the revolution was meant to benefit! By 1794, the tide had swung. With the foreign invasion repelled, Robespierre began to direct the terror against the extreme left wing like Hébert and Danton. But the pendulum could not swing back halfway. In July 1794, the Committee of Public Safety—essentially the leadership of the government during the most revolutionary phase—arrested and executed Robespierre himself. Robespierre’s execution opened a campaign against the most ardent revolutionaries. In 1796, two years later, the final effort to extend the revolution to address the needs of the working classes—the Conspiracy of Equals—was crushed and its leaders, including Gracchus Babeuf, were executed or sent into exile. The bourgeoisie emerged on the French political scene in 1789 already fearing the classes which it relied on to come to power. While relying on the social force of the peasants and a small working class, the bourgeoisie was most interested in enhancing its own political and social position. Such was the history of the French Revolution from 1789 to 1796. What made it so dynamic was that it was impossible to expect that the oppressed classes would have fought to the death for an opposing exploiting class without trying to assert its own interests. The slogans of “freedom, solidarity and equality” can spur people to action, but cannot sustain a life-and-death struggle. After the defeat of the left wing, the French government has seen any number of different forms. The constitution of 1795 replaced the Jacobin constitution, removing the social provisions and restricting voting rights to taxpayers only. Later, the dictatorship of Napoleon Bonaparte and even the restoration of a monarch made many wonder whether the revolution had been completely undone. But despite the forms that the government took over the years, each one protected the interests of the new ruling class: the capitalist class. Such a deep and thoroughgoing revolution as the one that spanned almost a decade could never be undone. The French Revolution made a deep impact across the globe. Its bourgeois goals were echoed in the sentiments of the European nationalists in 1848—with the difference that by that time, the young bourgeois forces were too frightened of the now considerable working classes to resort to revolutionary measures like the French. But its more radical goals—the liberty of the real “commoner”—were taken up in Haiti and Ireland and by other oppressed peoples around the world. In that way, the greatest bourgeois democratic revolution also set the stage for a new kind of revolution: one by and for the oppressed classes to end exploitation forever. That is the task of the socialist revolution.